My carpal tunnel acted out again, so I decided to spend yesterday outside, sketching. It's healthy to hold a real pen and pencil ones in a while instead of a computer mouse. After a careful consideration of a bus schedule, sunlight angle and an annoying fact that I draw much better when I am interested in a subject and I can be interested in a subject only when it's new to me, I decided to travel to a yet unexplored part of a town. At 10 AM I was already climbing Sunnyside hill. 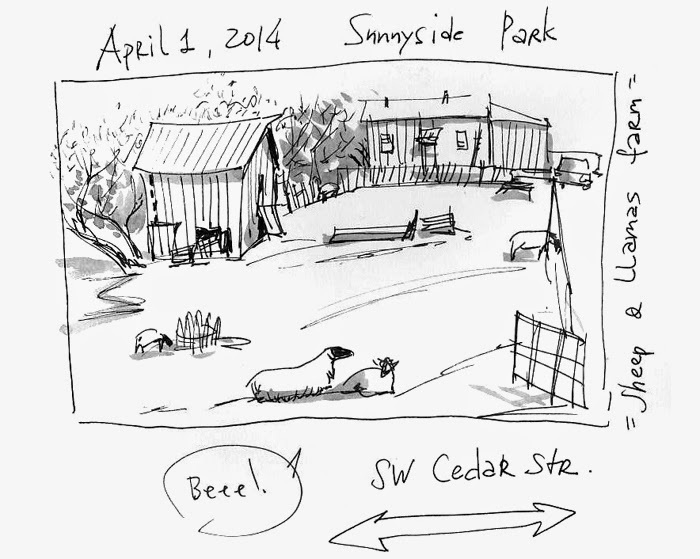 I was heading toward a big green spot on my map: Sunnyside park. "Nothing special, just a picnic area", - I was told before, so I didn't have very high expectations for the place. Well, what is the antonym for "disappointing"? "Appointing"? That was it. Very much appointing. The park itself was, indeed, just a big open space with a small lake and a big gunge gym, occupied by the miniature Americans and their mommies. But all around the park life became very very interesting. 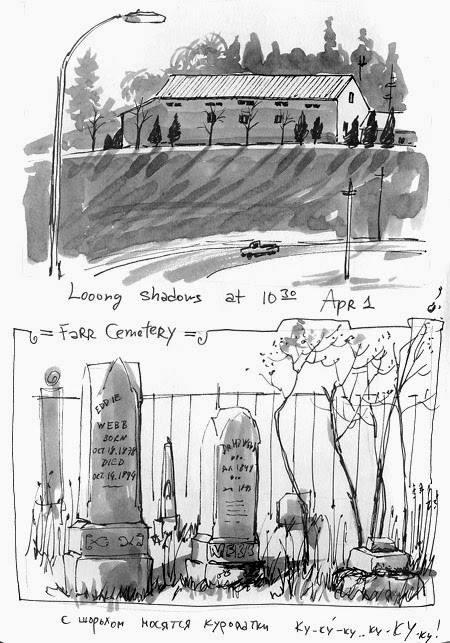 First, I stumbled upon a small very old cemetery with moss-covered marble headstones and tall dry grass, where flocks of quails were galloping with panicking screams. California quails (Калифорнийский хохлатый перепел in russian) are so funny running with their little plums dangling! Absolutely ridiculous. Local small-eared bunnies are on the second place in redonkulous contest. Rabbits are timid in this area. I found Montreal rabbits to be much more cheeky. There is a nice-size seep-and-llamas farm running alongside the Sunnyside park. I didn't understand if it was an interdependent business or they were affiliated with the park, but farm animals seemed to use park visitors for feeding. I mean they beg them for bred and such, not actually eating them. Children were ecstatic, and seep posed for picture suspiciously well. The park hill also offered a nice tall vantage point. Great view on nearby farms and fields. 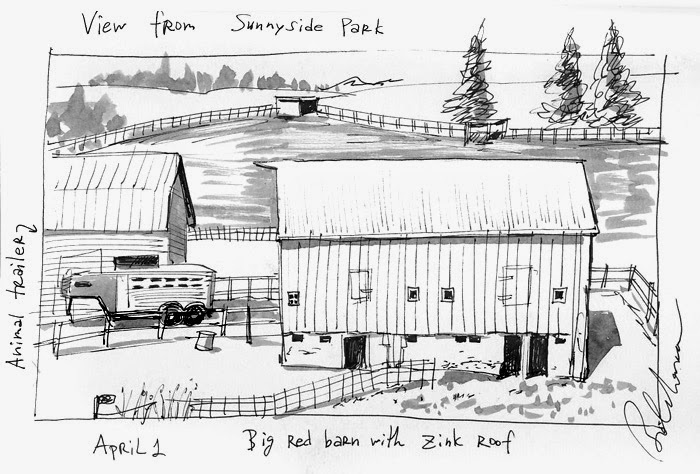 This red barn on a concrete ground base was in such a perfect stage of picturesque shabbiness, I wondered if the owner knew it and preserved it this way.